…It is essential to keep one’s eye on the whole story: dialogue, actions and situation. Peter began his trajectory to stardom at an early age. Bolstered by his family’s acting legacy and blessed with many talents, Peter’s path took him from London’s most famous stages to the lights of Broadway and the glamour of Hollywood in its heyday. After leaving Oxford, Peter immediately went to London to begin his acting career. He joined the leading Shakespearean company, and worked at Stratford and the Old Vic before venturing into the fledgling British film industry. During World War II, he stayed in London during the Blitz to perform in the West End opposite stars like Vivien Leigh and had his first chance to direct at the Old Vic where he eventually was appointed as Director. Peter realized that his calling and real talent was in directing, and by the mid-1940s, he established himself as a prominent West End director. He worked with some of the 20th Century’s most important writers, including Jean-Paul Sartre, Graham Greene, Tennessee Williams and Terence Rattigan. His star shone brightly in the West End but the challenges and lights of Broadway beckoned, so in 1949 he headed to New York. There he produced a string of successful stage productions starring Henry Fonda, Laurence Olivier, Alec Guinness, Anthony Quinn, Jackie Gleason, Vivien Leigh, and many more. Peter also directed Olivia de Havilland and Tommy Lee Jones in their Broadway debuts. He directed award-winning musicals, comedies and serious drama. Having established himself as “one of the most sought-after stage directors in America,” Peter set his sights on Hollywood. Peter was in the prime of his career and Hollywood A-listers were clamoring to work with him. He directed Alec Guinness in The Prisoner (1955), Danny Kaye in Me and the Colonel (1958), Summer and Smoke with Geraldine Page (1961), and Term of Trial with Laurence Olivier and Simone Signoret (1962). 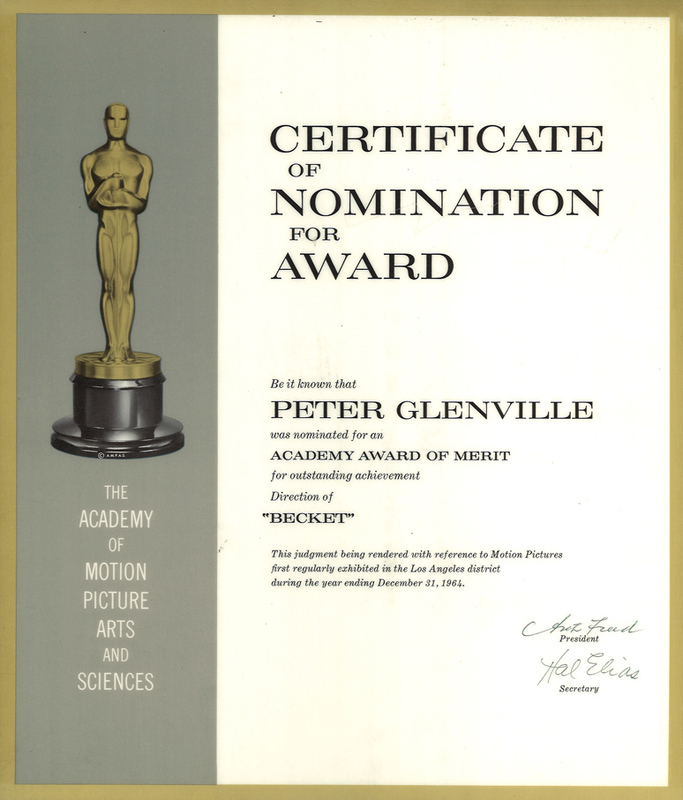 In 1964, his adaptation of Becket, starring Peter O’Toole, Richard Burton and John Gielgud, was nominated for 12 Academy Awards. He continued his stellar film career starring with Alec Guinness and Gina Lollobrigida in Hotel Paradiso (1966), and directing Richard Burton, Elizabeth Taylor, Alec Guinness, James Earl Jones, Cicely Tyson, Lillian Gish and Peter Ustinov in the star-studded film, The Comedians (1967).